Dedysh, S. N., et al. (2018). “Refining the taxonomic structure of the phylum Acidobacteria”. Int. J. Syst. Evol. Microbiol.. doi:10.1099/ijsem.0.003062. PMID 30325293. ^ Quaiser A, Ochsenreiter T, Lanz C, et al. (2003). “Acidobacteria form a coherent but highly diverse group within the bacterial domain: evidence from environmental genomics”. Mol. Microbiol. 50 (2): 563–75. doi:10.1046/j.1365-2958.2003.03707.x. PMID 14617179. ^ Barns SM, Cain EC, Sommerville L, Kuske CR (2007). “Acidobacteria phylum sequences in uranium-contaminated subsurface sediments greatly expand the known diversity within the phylum”. Appl. Environ. Microbiol. 73 (9): 3113–6. doi:10.1128/AEM.02012-06. PMID 17337544. ^ Eichorst SA, Breznak JA, Schmidt TM (2007). “Isolation and characterization of soil bacteria that define Terriglobus gen. nov., in the phylum Acidobacteria”. Appl. Environ. Microbiol. 73 (8): 2708–17. doi:10.1128/AEM.02140-06. PMID 17293520. ^ Bryant DA, Costas AM, Maresca JA, et al. (2007). “Candidatus Chloracidobacterium thermophilum: an aerobic phototrophic Acidobacterium”. Science 317 (5837): 523–6. doi:10.1126/science.1143236. PMID 17656724. ^ Coates, J. D., et al. (1999). “Geothrix fermentans gen. nov., sp. nov., a novel Fe(III)-reducing bacterium from a hydrocarbon-contaminated aquifer”. Int. J. Syst. Evol. Microbiol. 49: 1615-22. doi:10.1099/00207713-49-4-1615. PMID 10555343. ^ Liesack, W., et al. (1992). “Holophaga foetida gen. nov., sp. nov., a new, homoacetogenic bacterium degrading methoxylated aromatic compounds”. Arch. Microbiol. 162: 85-90. PMID 8085918. ^ Fukunaga, Y., et al. (2008). “Acanthopleuribacter pedis gen. nov., sp. 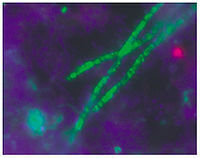 nov., a marine bacterium isolated from a chiton, and description of Acanthopleuribacteraceae fam. nov., Acanthopleuribacterales ord. nov., Holophagaceae fam. nov., Holophagales ord. nov. and Holophagae classis nov. in the phylum 'Acidobacteria'”. Int. J. Syst. Evol. Microbiol. 58: 2597-601. doi:10.1099/ijs.0.65589-0. PMID 18984699. ^ Huber, K. J., et al. (2016). “The first representative of the globally widespread subdivision 6 Acidobacteria,Vicinamibacter silvestris gen. nov., sp. nov., isolated from subtropical savannah soil”. Int. J. Syst. Evol. Microbiol. 66 (8): 2971-9. doi:10.1099/ijsem.0.001131. PMID 27150379. ^ Vieira, S., et al. (2017). “Luteitalea pratensis gen. nov., sp. nov. a new member of subdivision 6 Acidobacteria isolated from temperate grassland soil”. Int. J. Syst. Evol. Microbiol. 67 (5): 1408-1414. doi:10.1099/ijsem.0.001827. PMID 28141504. ^ Izumi, H., et al. (2012). “Thermotomaculum hydrothermale gen. nov., sp. nov., a novel heterotrophic thermophile within the phylum Acidobacteria from a deep-sea hydrothermal vent chimney in the Southern Okinawa Trough”. Extremophiles 16 (2): 245-53. doi:10.1007/s00792-011-0425-9. PMID 22212657.